The author of the book lost her father when she was only 19 and since then always assumes she’ll die young as well. There’s no reason to think it, there’s no genetic marker that will doom her. Her father had lung cancer after a lifetime of heavy smoking. Never mind. She’s now married and has a daughter of her own and is afraid she’ll die while her daughter is young, too, and decides to start traveling with her to make memories. She and Katie start with Paris, when Katie is just 8 or 9, just the two of them. Katie is much more pragmatic and easy going than her mother and takes the highs and lows of travel much more in her stride, and over the course of about 10 years and 4 trips Jennifer learns that she can focus on living instead of being afraid of dying. The book is also as much her remembering her father as it is describing the journeys so there’s a lot of flashbacks. I think I’d have preferred mostly travelogue because that’s what I love to read, more detail on your experiences, please! It’s probably about 50/50 flashback and current but it gives you the background on why Jennifer is the way she is, too. They visit Paris, Spain, Italy and then back to Paris for the last journey of the book. There are about 3 years between trips so the little girl is a high school graduate by the end and we see her grow up. I think no matter how old you are, that one on one time experiencing new things is special. 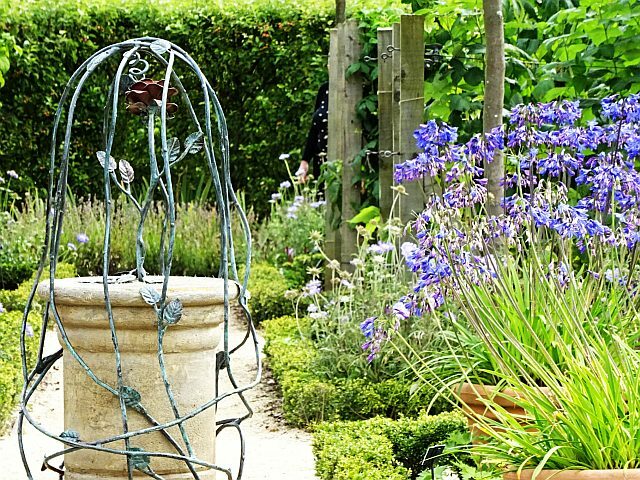 It doesn’t have to be an exotic European location, it can just be a long weekend away somewhere closer to home. Sue’s weekly word challenge this week is Happy. I’m happy. I hesitate to say it out loud sometimes because I fear I could jinx things. There’s also that old adage “Be careful what you wish for” that might come into play as well. But I am. I like my job and it provides me the means to do some traveling and gives me financial stability and a pension. I have a great family, both immediate and extended. We all get along and we all like each other as well as love each other. That’s not always that common. There’s never been any family feuds. That’s amazing! I’m really looking forward to my niece’s wedding in August. I have great friends far and near. As one faraway friend said to me yesterday when we both confessed that we were not great in keeping in touch more often that we know our friendship doesn’t need daily feeding to be solid. So true. I have a talented fiance who writes me a song every Christmas and draws awesome caricatures for my birthdays. We’re starting to put wedding plans together, too. I really like where I get to live, near the ocean in a nice city that’s not too big and not too small. This year’s Travel Happy includes a quick visit to Montreal to see my all time favourite band Queen and a road trip to New England in September. A holler back to this blog, where the Word a Week photo challenge originates. Mom was just a tad chilled. Since my dad died nearly seven years ago, my mother and I have taken a few trips, mostly short road trips. 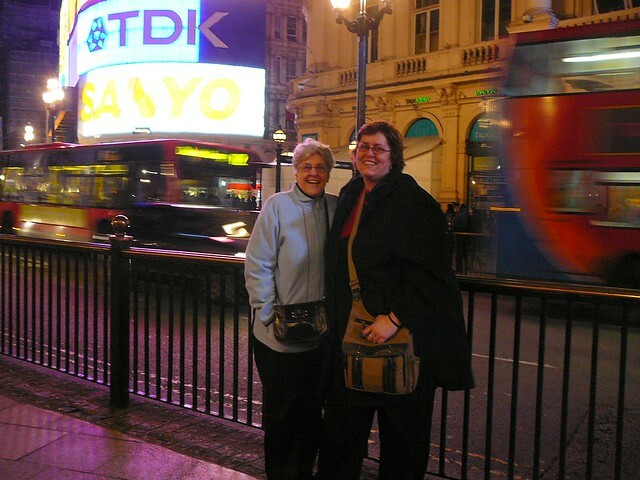 In 2008, I persuaded my mom to come to London with me for a 10 day trip. She’s been that far before, but only within Canada. We live on the east coast of Canada and the west coast is about as far away from here as England is in the other direction. She’d never been over the ocean and isn’t a really confident flyer but she decided she’d wear her big girl pants and just do it. When I first proposed the trip, she wasn’t sure there would be a lot that she’d be interested in. London. Really? I lent her my lovely Eye Witness London guide, filled with lovely pictures. She emailed back a list of things she might like as long as my arm! I wanted to make sure we’d stay somewhere central, easy for busses since she didn’t like the idea of going on the underground and I wanted to make sure it was a nice hotel, somewhere she’d remember. I decided on the Strand Palace and it was a good choice for us. We shared a twin room for the first 5 days and then over the Easter weekend, Graham joined us and she moved to a sunny single room down the hall from our double room. But the trip had a rocky start, with a jolt that scared the wits out of me. We landed on a drizzly Sunday, St. Patrick’s day and after checking into the hotel, we went out walking around Covent Garden, stopping at an old pub for Sunday lunch. We arrived in Trafalgar Square which was packed out with party people. There was a big stage set up for concerts and the parade had just finished so there was a lot of people walking around in green silly hats, bow ties, scarves, you name it. There was so much to look at and we headed down into Trafalgar square and the next thing I know, she’s on the ground in front of me across the shallow stair case! Oh my sweet god/dess I thought she’d broken a hip or knocked herself out!!! A couple of people helped me get her on her feet. No blood. No unconciousness. She was bruised and shaken but ok. Even her camera survived! I thought we should walk a bit more just to make sure she didn’t stiffen up but it was cold and damp so we walked back towards the hotel which wasn’t too far, got some hot tea and a snack at Starbucks and went to our room. After a hot shower we tucked up into bed for the evening to keep warm. Mom was bruised and a bit sore the next day but an Advil kept her going and she had her cane with her just in case so used that as well. She was a trooper all week and we saw a lot. St. Paul’s, Kensington Palace, Harrod’s. We went to two West End shows, we shopped, we took the double decker bus tour so she could get an overview of the city. We took a train to Brighton and shopping in the Lanes and were wowed by the Royal Pavillion. After Graham joined us, we three had a day trip booked to Leeds Castle and Canterbury Cathedral with a photo stop at the White Cliffs of Dover and an afternoon tea at a lovely country pub. That day trip to Leeds Castle and Canterbury was the coldest day I’ve ever experienced while in the U.K. and I’ve been there over New Year’s in the past. It was cold, damp, with a bitter wind. It even snowed just a little at one point. 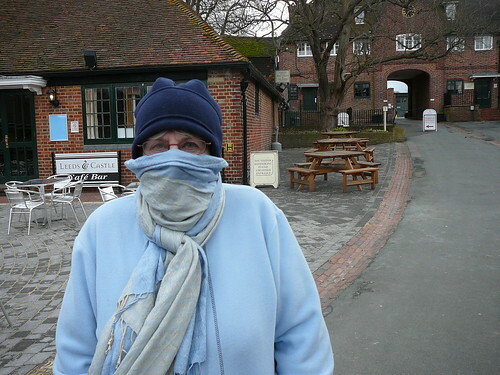 The photo with this article shows Mom at Leeds Castle. As you can see by her lovely blue eyes, she’s full of fun and wasn’t about to let the weather keep her down! I think I whined more than she did about it! She and Graham stood on the harbour beach at Dover in the blustery wind singing “There’ll be Blue Birds over the White Cliffs of Dover” while I huddled in the tour bus! I was going to post more photos relating to the challenge word but once I started writing, I decided this should be about us, my mom and me.